Living up to the Top Notch name, both the 23′ Dorado and 26′ Gause are the finest custom built boats for our area. Unlike most bay “flats boats” our boats are bigger, provide shade, comfortable ride and have plenty of room for up to 4 people. Both boats are rigged with top of the line equipment including, Lenco trolling motors, Moris electronic controls, Yamaha outboards, GPS map plotter / fish finders, custom towers and all the other bells and whistles. Our boats are equipped with double live well pumps, in case of break down, double bilge pumps, VHF marine radio, cell phone, and U.S.C.G. approved safety equipment. Nothing was overlooked in the design of our boats. Simplicity and versatility were the main objective when designing the Top Notch I , II & III. 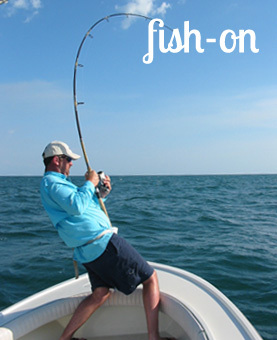 We can fish the shallow flats for snook and redfish in 12″ water, or run offshore to the many reefs Sarasota offers. The towers with fully operational control stations let us spot fish such as cobia, tarpon, snook and redfish which is a huge advantage in our area. The towers also provides shade for our customers. These custom designed boats have been developed over the years by guides and serious fishermen in our area. Everything has been considered in the design process from the pop up cleats and bow lights, to the cushioned combing pads and seats. Both boats are kept in immaculate condition and in great working order and I am sure you will enjoy fishing on them. The combination of classic hull design, luxurious interior and fishing abilities makes the Top Notch fleet of boats a fisherman’s dream!